Every goat loves a cookie now and then. You can make these simple baked treats at home. 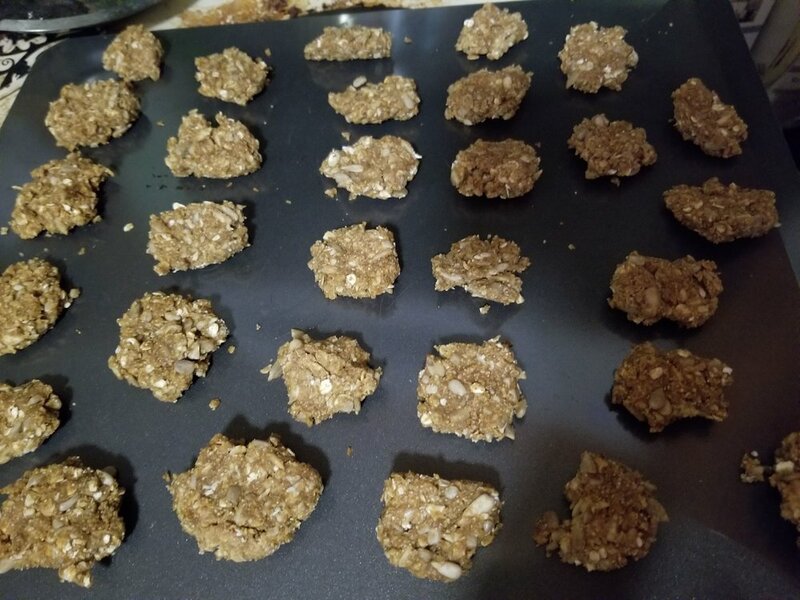 Like my homemade chicken treats, these goat treats can be made with a variety of items you have on hand. Feel free to add dried, chopped fruits, honey, beneficial spices such as garlic and cayenne, flax and other seeds, and even alfalfa meal for a variety of treats to please. Preheat oven to 350f. Mix your flour, oats, and seeds together. Add 2 large spoonfuls of peanut butter and 1/4 cup molasses or honey. Add a little water, until batter is a crumbly paste. Squish small balls of batter into rough cookie shapes and place on a baking tray, bake in preheated oven for 20 minutes. Allow to cool before storing. I like to put these in little zip top bags so they can easily ride along in my apron pocket. You can make these cookies large or small, I make a variety of sizes for different sized goats. These are also soft enough to be broken in half if you decide you want smaller pieces. A note on treats: I don't give treats every day. These are a special occasion snack for when I need to train or administer medicine. (My goats get a cookie after a shot, just like kids get a lollipop after a vaccination.) These are meant to be fed in a limited quantity - 1 to 3 treats in a day.